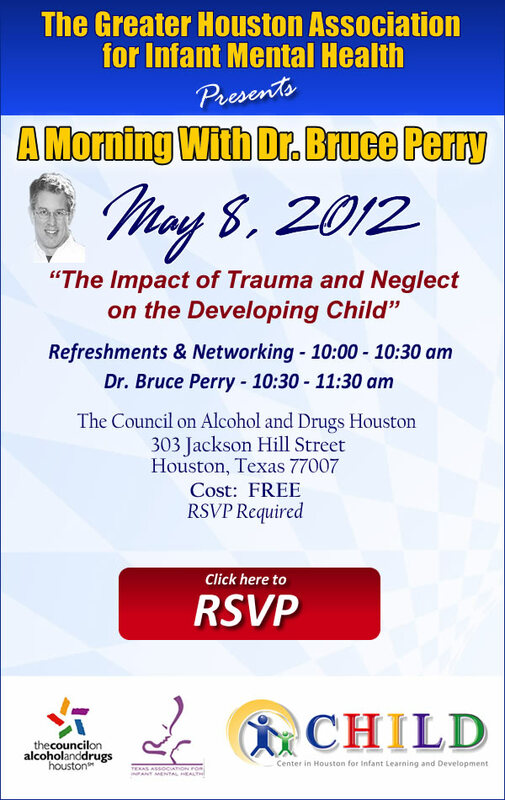 The Greater Houston Association for Infant Mental Health (GHAIMH) is pleased to invite you to a special mid-morning event featuring renown authority on children in crisis, Dr. Bruce Perry. GHAIMH is especially pleased to be able to offer this event to the community at no cost. The development of a young child is profoundly influenced by experience. Experiences – good and bad – shape the organization of the brain. The ultimate effect is to impact emotional, social, cognitive and physiological functioning. Insights into this process come from understanding brain development. Both trauma and neglect, the absence of essential developmental experiences required to express a fundamental potential of a child, are pervasive problems in our culture. Various forms of neglect are possible and include splinter neglect, total global neglect and emotional or relational neglect. Chaos, threat and abnormal patterns of emotional, social, cognitive and physical interactions with young children lead to an array of brain-related problems. This presentation will review clinical work and research that can help us better understand developmental trauma, neglect and the relational problems that arise from neglect and threat. An overview will be provided that suggests new directions for clinical practice, program development and policy. Bruce D. Perry, M.D., Ph.D. is the Senior Fellow of The ChildTrauma Academy, a not-for-profit organization based in Houston (www.ChildTrauma.org) and adjunct Professor in the Department of Psychiatry and Behavioral Sciences at Northwestern University School of Medicine in Chicago. Dr. Perry is the author, with Maia Szalavitz, of The Boy Who Was Raised As A Dog, a bestselling book based on his work with maltreated children and Born For Love: Why Empathy is Essential and Endangered, published in April of 2010. Over the last thirty years, Dr. Perry has been an active teacher, clinician and researcher in children’s mental health and the neurosciences holding a variety of academic positions. Seating is Limited. RSVP Required.